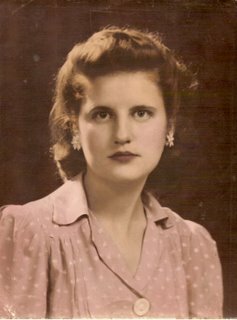 So, Grandma, mother of 12, grandmother to 26, wife to Arnold, devout Catholic, peace, and love, and gratitude to you as you go to that which is beyond our words. This entry was posted on Wednesday, May 3rd, 2006 at 1:45 am and is filed under about e and her life, Christianity, coping, death, loss, my family. You can follow any responses to this entry through the RSS 2.0 feed. You can leave a response, or trackback from your own site. My thoughts and prayers (or the UU equivalent) are with you. May you find the comfort you need at this sad time. i had to do a double take on that picture – you bear a keen resemblance to your grandmother! take care…. thank you both jeff and emmjay. yes, i look both a lot like my grandma and my mom. i once saw a picture of my mom when she was young and i thought it was me and for the life of me couldn’t figure out when or where the picture had been taken. my mom and her sisters all look very similar too. must be some strong genes from that side of the family.